Three games, six goals in each, three wins. Quite the streak for Omaha, but it was against the likes of Colorado College (one win) and Miami (two wins). And on the flip side, Omaha needed the six because they gave up an average of 3.33 goals in these three games (4,4, and 2 respectively). So does Omaha have a defensive problem? 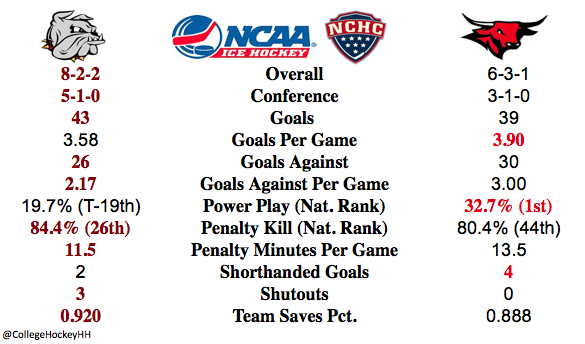 Maybe as they have no shutouts and give up 3.00 goals per game, 29th in the nation. But who needs a good defense when your your offense is so good? Enter UMD. One third of the way through the season and the Bulldogs are right in the thick of the top teams behind a fairly stout, albeit bend but don't break, defense. That defense will be tested this weekend in Omaha. I expect well played games with lots of speed. And ultimately, it will be a good trip for UMD. Picks by @afiskness. The Bulldogs split last weekend against resulted in a drop from top ranked team in the nation to number 2 spot. The second game of the last weekends Bulldog series was a great team effort with fantastic goal tending. If this continues all season the number one spot will remain within their grasp. Miami at Denver: The Redhawks don't have any mojo right now and going to Magness Arena to play the Pioneers usually is not the spot to find your mojo. Pioneers sweep. 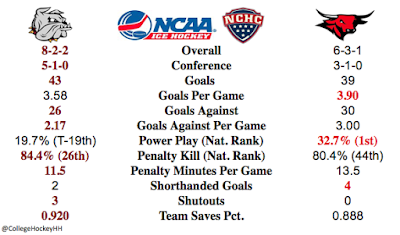 North Dakota at St Cloud State: This should be two great games and we may learn a lot about both teams. The Fighting Hawks find themselves in the unusually spot for them in 7th place in the NCHC but within reach of moving up to 5th place past the Huskies with a sweep. Both teams are struggling between the pipes which will they will need to improve to make a push for the top half of the conference. I am picking a split, but I would be too surprised to see a Husky sweep. Minnesota Duluth at Nebraska Omaha: Baxter Arena, the home of the Mavericks surprisingly has not been overly kind to them this season. The Mavericks have the ability to put up a bunch of goals which will required the Bulldogs to keep their heads in the game if they want to come out on top. I am picking a split. Air Force at Western Michigan: The Broncos proved last weekend that they are a good team getting a big win on the road. This weekend series heading home the Harry W. Lawson Ice Area will be big advantage for this fast skating team. I expect Air Force will have a tough time keeping the Broncos and Matheson Lacopelli off the scoring sheet. Broncos sweep.